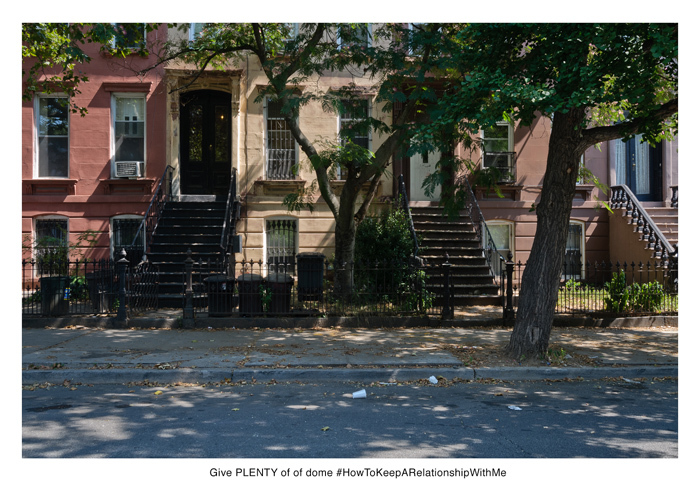 Nate Larson & Marni Shindelman are a photography duo base in the USA that through works, like Geolocation: #HowToKeepARelationshipWithMe (New York City, 2012), examine and explore notions related with memory and witness. The disruption caused by their technical and visual approach invalidates a series of geographical conditions affecting our human activity. In Where Do We Go Now! Part V: Nate Larson & Marni Shindelman aims to assess the dynamics and notions engaged in the four previous compositions, with Délio Jasse, Carlos Palma, Jane & Louise Wilson and Lara Shipley, while leaving loose a series of questions related with the contested territories of contemporary photography in a digital-democratising age (from being a visual medium for collective memory to issues about geography), and on the limitations of photography in terms of narrative capacity. Geolocation: #HowToKeepARelationshipWithMe (New York City, 2012) is supported by Light Work, Syracuse, New York (USA).